Portraying the warm and witty side of Australia. these attractive Australiana Coasters with illustrations by Andrea Smith say much more about the country's aesthetic than dodgy Sydney Opera House snow domes. Andrea Smith uses paper collage to create original works, seen here on these appealing coasters. She takes her cues from the vibrant energy of traditional folk art and tries to tell a story with these images. The only downside to this beautiful set of coasters is that you won't want to cover them up with a drink. Designed in Australia by Andrea Smith. Crafted from MDF/ Cork backing. 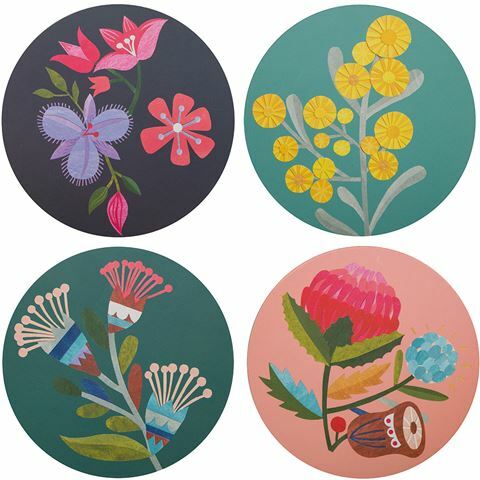 Each coaster is decorated with different fauna including Correa, Wattle, Waratah and Wild Iris. Presented as a set of four in a clear box.